In this fast-paced era where everything is mass-produced and done with machines and assembly lines, it’s refreshing to encounter products that are still made lovingly and painstakingly by hand. That’s why I was so excited about getting the chance to try Bonbons Barnier. 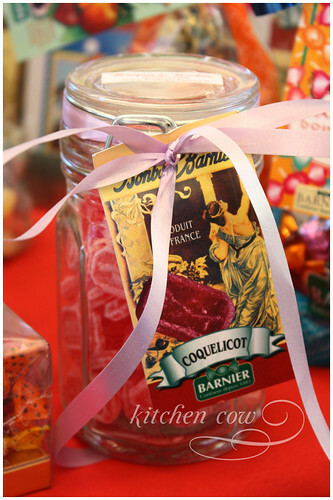 Bonbons Barnier hails from Rouen, the capital of Normandy. It was first created by the brothers Pierre and Marcus Barnier back in 1885. To this day, these French confections are still made the traditional way; they’re cooked in small batches in copper pans, then filled with real fruit pulp, nut praline or chocolate. Surrounded by a very fine sugar crust, these handcrafted candies have a unique flavor and texture that can’t be found with modern, mass mass produced bonbons. Now, these traditional French sweets have finally reached Philippine shores, thanks to Mr. Wally Schieve, proprietor of confiserie store Bouquet de Bonbon. Missing the taste of the French bonbons he grew up with, he decided to bring in Bonbons Barnier to fill the need for real fruit candies. 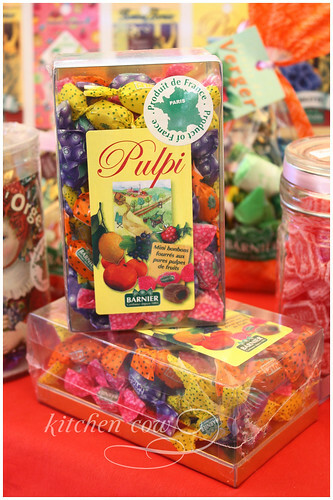 True enough, Bonbons Barnier is leagues apart from other fruit candies I’ve tried. These small candies are pretty unassuming. They look pretty ordinary, but once you have them in your mouth, the fruit flavors just spring to life. What makes it extra special though, is when you get to the soft jam core. Made of real French fruit jams, the candy center spreads softly on your tongue, assaulting your senses with flavors of the French countryside. Or put more succinctly, it’s sooooo good. 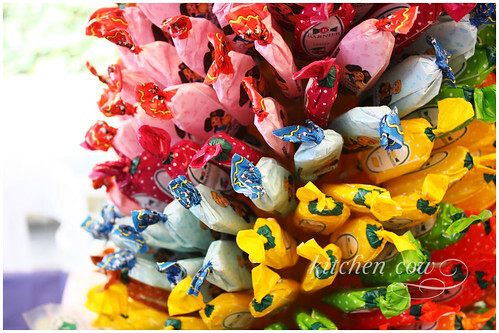 Bouquet de Bonbon’s candies aren’t limited to the fruit-filled hard candies. 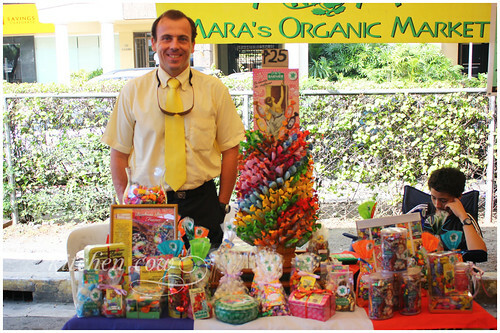 They also carry the unwrapped hard candies, lollipops, pralines and soft caramels. Unfortunately, the day I dropped by their Legaspi Sunday Market stall, the caramels were already sold out, while the pralines were still due to arrive. Seeing how in demand they are, it makes me want to try them even more. Wait for me, Barnier! We shall meet again. My entry to the weekly Photo Meme, Lasang Pinoy Sundays. This week’s theme is Eye Candy. This entry was posted in blog carnivals, culinary events, food shopping, food spotlight, sponsored events and features and tagged artisan candy, barnier, bonbon, bouquet, candy center, caramels, confections, fruit candies, fruit flavors, fruit jams, fruit pulp, hard candies, legaspi, praline, schieve, wally. Bookmark the permalink. sounds yummy. I wonder where I can get them here…. hmm. Oh!! They have it in Madison! Lollipops for 25 bucks, small packs of candy at around 100 or so up to 1k for the giftboxes. Mind you though, these are the Legaspi Sunday Market rates. Distributor prices, no added mark-up. Still worth it, I think though. 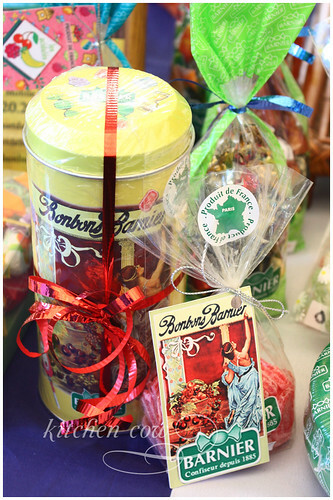 Bonbons Barnier is an international brand. It might be available at your local deli? Or maybe online would be feasible too. Or you can try Legazpi Park on Sunday. Much nearer your house. Plus you can check out the other goodies! I have to remember to get myself some soon… I really liked these candies! Just got an email from them. A lot of their new stuff (like caramels!) have come in. Let’s hit Donau soon? They’re good, you should try them if you get the chance. the place to find the whole line of product of Bouquet de bonbon/Barnier at best prices is Legaspi market from 7am to 2pm. Coz it sraight from official distributor. Bouquet deliver for free in makati area. All of the candies are very good but the candy that I prefer is the mini pulpi because inside the mini pulpi there is real jam fruit and it’s made for the childrens mouth.And in legaspi market the candies are less expensive then in other shops. U NEED TO TRY THOSE CANDIES!!! I love the mini pulpi too! The size is perfect, not just for kids but for grown-ups too. They're like little gems of flavor. Bonbons Barnier is a treasure find! And the fact that it came from France made it more appealing. Prices are not bad all considering it is imported and you get your money’s worth. The mini pulpi was my first favorite. You cannot stop eating it once you started. But when the caramels arrived (especially the salted butter caramels and lollies), it also became a hit for me. On the lighter note, the Berlingot (triangle shaped unwrapped candies) are fun to eat/play with. It retains its shape even if it is already on its tiniest piece. Try it. It’s really fun! I am ordering the lootbags for my son’s first birthday from Bonbon Barnier. I am even more excited for this than my kids. Ha ha!